(Feb. 11, 2019) -- To cultivate a zero-tolerance environment for all forms of sexual assault and misconduct at UTSA, President Taylor Eighmy today announced the President’s Initiative on Preventing Sexual Assault and Misconduct. Building on several past initiatives that led to the creation of the UTSA Office of Student Advocacy, Violence Prevention and Empowerment last year, this new initiative framework elevates university-wide efforts to foster a campus environment that is safe for all Roadrunners to study, work and live. Programming and Outreach – Students, faculty and staff members on the Violence Prevention Action Team are already working to create a new slate of programs for the campus community. These include enhanced Orientation programming for incoming students and a peer educators cohort, among others. To support this work, UTSA has joined with 37 other colleges and universities in the Culture of Respect Collective, a rigorous two-year program designed to help institutions improve their approaches to addressing sexual violence on their campuses. Training and Development – This task force will develop an expansive set of sexual assault/misconduct educational opportunities for UTSA students, faculty and staff. Existing campus trainings will be reviewed—and new ones explored—to identify the most effective ways to equip Roadrunners with tools for prevention and bystander intervention. Continuing to develop an understanding of these issues is fundamental to becoming a more inclusive, welcoming and safe campus. Data Governance and Reporting – Several units across the university collect information on sexual assault and misconduct incidents to fulfill various legal requirements for reporting. This task force will connect these efforts through a data governance structure to improve clarity, consistency and transparency, allowing the university to better quantify trends and track progress. An initiative steering committee will create additional pathways for institutional systemic and culture change. A critical part of its work will be to evolve this initiative by creating action plans based on the findings of a forthcoming Title IX Office external review and sexual assault allegations investigation. These reports will inform the work of Suzanne Patrick, the new UTSA director of Equal Opportunity Services and Title IX Coordinator. Both reports will be shared with the campus community when they are complete, and the findings and recommendations will be addressed as soon as possible. Learn more about UTSA’s Safe Campus Resources. 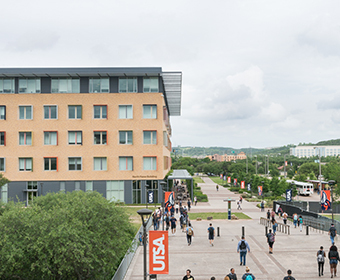 Learn more about UTSA’s vision.